Welcome to Blue Butterfly Books! Welcome to Blue Butterfly Books! Our Books are available as pdf downloads or softcover books – in full color or black/white. Sustainability and Eco-Responsibility Here at Blue Butterfly Books, trees are valuable to Mother Earth and the health and wellbeing of everyone. Minimizing our ecological footprint and effect on the environment, we choose Create Space, an eco-responsible printing company. Electronic routing of our books reduces greenhouse gas emissions, worldwide. When a book order is received, the order is filled at the printing location closest to the client. Using environmentally friendly publishing technology, of the Espresso book printing machine, Blue Butterfly Books are printed as they are requested, saving thousands of books, and trees over time. This process offers the stable and viable alternative keeping healthy sustainability of our environment. All paper is acid-free, and interior paper stock is made from 30% post-consumer waste recycled material. Safe for children, Create Space also verifies the materials used in the print process are all CPSIA-compliant. By purchasing this Blue Butterfly Book, you have supported Full Recovery and Preservation of The Karner Blue Butterfly. Our logo is the Karner Blue, Lycaeides melissa samuelis, a rare and beautiful species whose only flower for propogation is the blue lupin. The Karner Butterfly is mostly found in the Great Lakes Region of the U.S.A. Recovery planning is in action, for the return of Karner Blue in Canada led by the National Recovery Strategy. 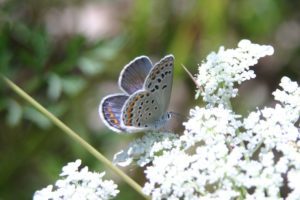 The recovery goals and objectives are aimed at recreating suitable habitats for the butterfly and encourage the growth of blue lupines – the butterfly’s natural ideal habitat.